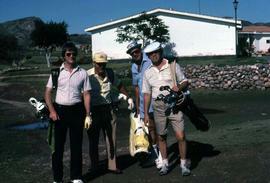 Colour Kodachrome 35mm slide depicts four unknown men with golf clubs posing for the camera. 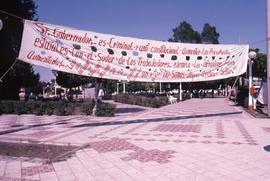 Colour Kodachrome 35mm slide depicts a white cloth banner hung over a sidewalk with a Spanish sentence painted in red. Colour Ektachrome 35mm slide depicts seven unknown people sitting on the ground next to a brick wall posing for the camera. One of the women is sitting on a yellow cushion. Colour Ektachrome 35mm slide depicts four unknown men standing behind plant and leaning on a metal fence. There is a sign on the left of the image which says: No Fumar, No Smoking". Colour Kodachrome 35mm slide depicts a group of unknown people on a golf course. Each person has a golf club and there are piles of golf balls on the grass. Colour Kodachrome 35mm slide depicts three unknown people sitting next to trees in the centre courtyard of a building. Colour Kodachrome 35mm slide depicts a group of unknown people posing for the camera with drinks on the table in front of them.